Home » Blog » General » How Online Poll help You in taking better Business Decisions? 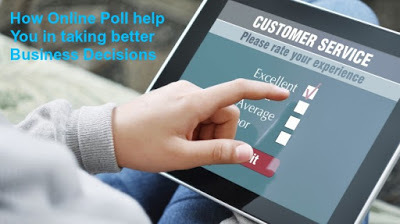 How Online Poll help You in taking better Business Decisions? The world around us is evolving at a much rapid rate and with the advent of social media it has become as fast as it could get. With internet revolution everything around us seemed to be directly or indirectly dependent on internet. Any business has to take many small and big decisions on a regular basis to deal with the market scenario. With internet, businesses are going for online poll/survey to get information from the respondents. The primary data gathered from the respondents forms the basis for taking better business decisions. Through online poll, business gets all the relevant information about various attribute on which the poll is conducted. PollDeep, the most comprehensive and flexible free online poll creator is here to help you with any kind of survey that might be helpful to you. It has been designed after proper scrutiny and analysis of various features. It comes loaded with unique and latest features to help you with creating, managing and sharing the results of your online survey/poll. Through online poll you can connect to a larger number of respondents within a short period of time. The duration of time which is invested in these kind of survey is usually very less as compared to the time that is needed for a manual survey. Some of the major reasons how online survey helps in taking quick and better business decisions are given below. Measuring Brand Awareness: Online poll can help you get reliable and high quality results from your respondents. These valuable insights are instrumental in giving you an idea about how your customers perceive your brand. You can measure your brand awareness through online survey. Tracking Customer behavior instantly: These online poll builders help you to conduct online poll/survey which can be filled by the respondents at any point of time. You give the liberty to your audience to reply at any time and from anywhere which best suits them. Creating Customizable Solutions: You can design your online survey according to the market you are targeting. Customize your online poll questions to suit your audience needs and requirements. You can target any customer without any geographic boundary and get the best result. Connecting Global Respondents: Break the barrier of place and reach people all around the globe with online survey. You will get to know various inputs on habits, opinions and perceptions of your customers who are living all over the world. Tapping Emotional Insights: You can design question which triggers the deeper and emotional side of your respondents. Try to get more than the usual answers to your questions. Gather the feedbacks and suggestions from your customers which can help you in improving your products.